This DVD details how to perform, step by step, 36 different horse chiropractic adjustments. 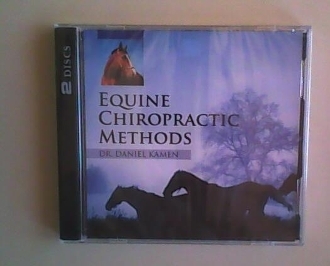 Presented by Dr. Daniel Kamen, D.C. author of The Well Adjusted Horse. These are the exact same horse chiropractic techniques used by professional horse chiropractors. Full spine, and extremity techniques plus hip, pelvis, jaw and tail. You will also learn the "pre-race adjusting sequence" that can help cut a full second off the time. "An efficient horse is a fast horse." You also get a great bonus: Dr. Kamen's Equine Skeletal Anatomy DVD. This DVD shows Dr. Kamen explaining the important skeletal anatomy points on a life size horse skeleton. Total running time for both DVD's. 3 hourse and 15 minutes.